"Hey Giuseppe what year is it?" "Well Mario, are you too lazy to check your own sun dial?" "Mine's running a bit slow, plus it's only in hours not years, and the Sun's gone in." "It's around the year 1200 by my dial Mario." "Who's been keeping count on the years, anyway?" "Last time I looked I found Aldo sleeping on the job, who knows how many days we've lost?" "I know, I saw him drop all his counting stones and some went down the drain, we might be years out too?" Hopefully Marco will bring back the abacus from China, so we can keep a more accurate count." Great, well I fancy a spaghetti with Napoli sauce for lunch." "Mario, Marco Polo hasn't discovered spaghetti yet, you can probably rummage up some pasta though, we've got some of that?" "Who's making up this history then?" "Everyone, anyone. Anyone who sounds like they know what they are talking about." "Bugger it, I can't write so I can't do any history. I wanted to make some up myself." Fantastico, well pasta it is then." "It's only in flat sheets we haven't done any modelling with it yet," "Right, bring me the tomatoes then." "Sorry we won't be getting those, the market is completely out of them." "Oh? When will they be getting them in do you think?" "In about another 300 years." "Damn I'm famished, I can't wait that long." This is starting to sound like the Monty Python 'Cheese shop' sketch." "You realise they are in the deadly night shade family those tomatoes don't you? " "I won't be eating them for a while yet, myself, Mario." "I might eat the yellow ones though". What have we got to eat around here?" "Beats me." "Let's face it, with out tomato, that rules out just about every thing?" "What about Pizza?" "You need tomato for that," "What prey tell have we got?" Bring me my chariot I'm going for a spin to Vietnam for a Bún." "Bún?" "It's Bún like if a Scottish girl said Gun, but with a B". "Er, we haven't invaded Briton yet, so that doesn't help me"? "The men don't like kissing each other there, so they won't appreciate us when we invade"
Why don't we zip over to Melbourne, they've got it all there? Splendifico, let's go." "Are you coming Marcello?" "have you got room?" "Did you think we would leave you starving there when there's room on the chariot for three?" "What about Jake the fake?" "There's no room for him, and he's not Italiano." "That won't be as big a hit as you two little boys." "Al K. Hol?" "No come on chariot away." 'Craaack' (whip lash) "Nic O. Tine?" "What are you a Rolf Harris fan?" "We'll need to be if we want to fit in there," "No that's England, I told you we haven't invaded there yet." So where can you get a good Bun"? "Ask Clive James, he goes a Wimpy"?. That's not it? Wiki said it was? So what is this Bún?" "Well it's a vermicelli," "Hey that's one of our words?" "Yeah, something has gone for Burton there, with the history writing?" "Come on stop messin' about." "ok, ok," "Isn't ok an American lazy expression," "Has Columbus been there yet?" "No that's around 1400 odd" "oh yeah, but then what the hell, we should be speaking Latin?" "Yeah, anyone know any?" "Anno Domini?" "Christ that's not going to help us much." "This meal is going to be great, It's kind of a salady thing, so it's probably good for you, actually I'd say definitely good for you" who's talking here? I don't know about a lot of the variables on this dish. What I do know I think is that Bún is vermicelli and there are a whole range of things that have Bún in the recipe. There is a soup that's not a pho that starts with the word Bun that has blood and chilli and pigs trotter in it. I wasn't a big wrap for it, when I had it but the flavor was ok, I think that is another progression I haven't got to yet. So, vermicelli, sliced up slivers of Lebanese cucumber (what's that doing in here?). The Vietnamese took a few things on board from the French and the Indians and a few others, things they liked that is, they are very discerning you know, the Vietnamese. There's julienned pickled carrot (my favourite bit, almost). Fresh uncooked beanshoots (mung), Vietnamese mint (sometimes) coriander (sometimes) always one or the other, normal mint (sometimes, when this is in it, it takes it to the fifth dimension in my opinion). Shallots, garlic, chilli peppers, sugar, fish sauce, lime juice, salt and pepper oh and chopped lettuce, roasted peanuts and Nuoc cham, a dipping sauce you pour on. See this article for more info. These are the basic ingredients which do vary depending on where you go. then of course there is a meat that goes on the top, this is my favourite bit, I don't know exactly what they do with it, marinate and then grill it I believe (I know actually) sometimes they have chicken and lemongrass grilled (this is magnifico, Mario, I know you Italiano's have a vertible smorgasbord of lovely grub, you'd have thought you had all the taste sensations covered with your kitchen expertise alone, but there are some of our Asian mates have added whole new playing fields). Where was I, oh yeh so this dish I have selected here is one of the many variations on the same thing. You can get one with just chopped up spring rolls (Chả Giò) on the top. This most recent one I ordered had a roast pork and a couple of Chả Giò thrown on for good measure, which when you are on a tight budget, it's like an entrée with a main meal all rolled into one. If you haven't heard of or tried one of these, I'm thinking you will love it. It is probably one of the healthiest of meals and the best thing, I've never paid more than ten bucks for one. When my partner first came down from the country, I tried to get her to eat one, she wouldn't go near it. I think she was expecting to find a slug in it. Now she loves them, as does my daughter. I've been to a few of these, Viet Rose, I don't know whether they are a chain. 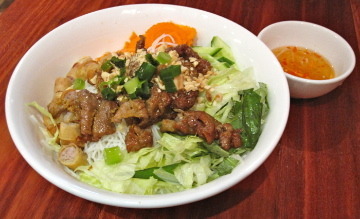 The one where I had the best Bún was in Ascot Vale I think, (it may be Moonee Ponds). Anyway it's closed down now. The reason I mention it is because it was a good one, and I've heard good reviews about this one in Brunswick Street too. If it is a chain (there's one in Chapel Street I think, maybe Acland Street too. I say maybe since they don't appear in the search engine.) they will all be the same. I read someone's blog and they said that this was the dish they used as a yardstick to gauge all Vietnamese Restaurants. This is not good advice as I have rarely had a bad one of these. It's hard to stuff it up. There are things that vary from restaurant to restaurant. One such thing is that some serve the vermicelli cold, some warm and some hot. I first had one of these probably 10 or 15 years ago, when it came out, I started eating and had to send it back to the kitchen, I told them that they'd forgotten to cook it. The Waiter said something under his breath, which I couldn't understand. I'm presuming that it's supposed to be cold, but to try to accommodate the honky, they now heat it up, which I'm glad about. This one at Ascot Vale had a lot of vegetation and was very good. It's unlike anything you've had I suspect. It's like to food what a centaur is to man. Half salad, half hot meal, if you get the one with Chả Giò it becomes a Siamese twin centaur. That's not a really an appetite inducing thought though. A real Beauty, from Phong Dihn. I've reviewed this one, I've been here a few times now, and never been disappointed. I thought I'd try the Bún last time I went, to tell you the truth I just used to call it the 'Vermicelli' as they do. But I asked the waitress how to pronounce it and the owner. Since we used to call the pho a soup, I thought it's time for Bún to make an entrance. This one was lovely, and more than lived up to my high expectation. This is where I actually had the meal I've described at the top Bún Thịt Nướng Chả Giò, which has the added benefit of a few spring rolls, chopped into pieces (Chả Giò). Even though I've said they are nearly all the same, this one might just be a hairs breadth in front of the others. It was fresh and clean, and a beautiful flavour. I had a Bún here, and it was good, nothing less nothing more. As I said they are nearly all of the same standard. The main variation is the herbs they put in, which is usually one or two of the three mentioned earlier. The normal mint adds a new dimension in my opinion. So feel confident having one here if that's what you fancy. Find out whatHung Vuong means here. This was one of my favourites for a while, a while ago, their Bún was one of the best, it was the first time I had the normal mint, and I loved that, the only trouble with this place the service can be a bit hopeless, even when they got to know us. But I think the chefs know what they are doing, and they did have a bit of a makeover recently so it's got a nice vibe in there now as well, it reminds me of Indochine in Box Hill which was one of my favourites 10 years ago or more. The prices are reasonably cheap particularly the Bún. This is a food blog, that looks really good, she talks about her Vietnamese Mum's cooking, this was one of her dishes too. We actually make this ourselves and can get it pretty nearby for flavour. Give it a try, it's lovely and good for you. You feel better after eating one. Why? Another tasty Vietnamese dish. Cost: Less than ten bucks.